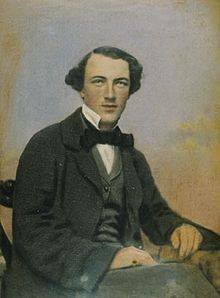 The Tom Wills Society (TWS) was established in October 2016 to commemorate and perpetuate the tragic life and outstanding sporting deeds of Thomas Wentworth Wills (1835-1880) one of the Founding Fathers and co-writer of the original rules of Australian Football. Tom was an Australian Rules player, coach and umpire involved with the establishment of the Melbourne Football Club and played for the Richmond and Geelong Clubs. Tom Wills was also a highly talented Colonial Cricketer and was the coach of an indigenous team of Western District cricketers from Victoria who successfully toured England in 1868. To become a member or be notified about the Tom Wills Society regarding news and events including the Annual TWS Dinner please email Phil Dimitriadis via pkad23@yahoo.com.au. Submissions for articles for publication on this page are also welcome via this address.